When studios send out DVDs of the latest movies for the consideration of awards voters, that content is supposed to be on lockdown. Instead, copies of virtually all movies leak to the Internet and are downloaded by millions. Later, adding insult to injury, these DVDs appear in dozens of eBay listings, on sale for a few bucks. During the latter part of every year, pressure builds as Internet pirates prepare for the inevitable. 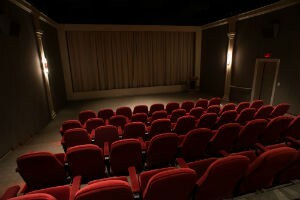 Having been sent out to industry professionals “For Their Consideration”, so-called DVD Screener copies of the latest movies begin to hit the Internet. Last year was a pretty memorable one with some massive titles hitting the web. Both The Revenant and The Hateful Eight were furiously downloaded on BitTorrent before their theatrical debuts, causing shockwaves and controversy as anti-piracy advocates took the opportunity to bemoan droves of “Internet thieves”. But of course, these leaks have to originate somewhere and as revealed in February with a high-profile arrest, movie insiders are often to blame for content being made available online. While Kyle Moriarty from Lancaster admitted to copying screeners of The Revenant and The Peanuts Movie while working on a movie studio lot, other DVD screeners do make it to their intended recipients. However, even though these people are supposed to guard the discs with their lives, some don’t appear to do so and are happy to let their friends view them in advance of their theatrical release. To see the scale of the issue one only has to turn to the world’s favorite online auction house. Known as a source for just about anything, it turns out that eBay is also a great place to buy DVD screeners, presumably being offloaded directly or indirectly by those who were expected to review them. 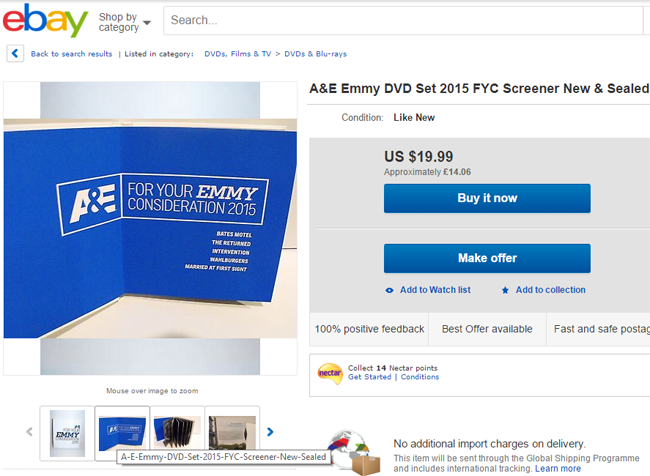 For example, for just US$16.53 one can currently buy a lovely Emmy ‘boxed set’ of TV show screeners including episodes of Bates Motel, The Returned, Intervention, Wahlburgers and Married at First Sight. For those more interested in movies, eBay has plenty of treasures available. 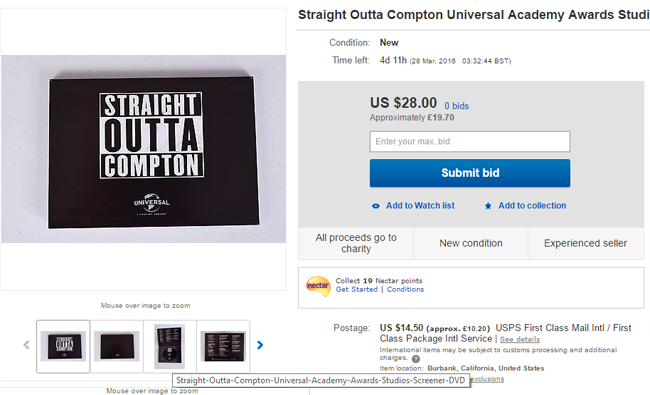 Around December 17 last year a DVD screener copy of Straight Outta Compton leaked onto the Internet. Just a handful of months later and it appears that screener recipients are looking to convert those discs into cash via the popular site. And the more one digs, the more titles appear. A copy of Tom Hardy’s Kray’s movie Legend, for example, along with a vintage copy of Inglourious Basterds, and many, many more besides. Shame the Walking Dead screeners aren’t more recent. Finally, if binge-watching is more your thing, Netflix screeners are also catered for on eBay. 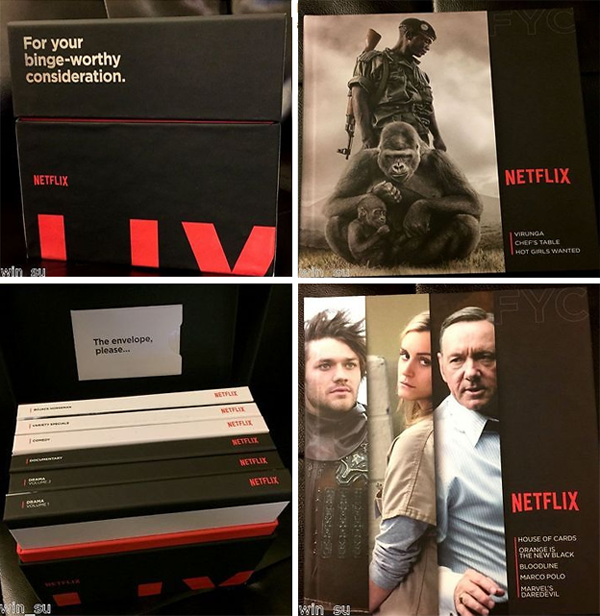 Apparently the company sends out huge box-sets for recipients’ binge-worthy consideration.